Which Mezzanine Floor System Do I Need? Which Steel Framing System Do I Need? An economical friction-fit system to assemble frames for strong, compact, lightweight non load-bearing partitions. 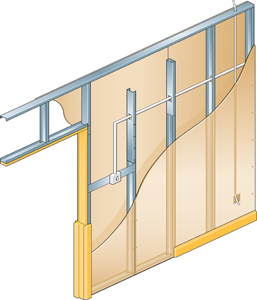 The metal stud partitioning is ideal for use in domestic and commercial situations, for heights up to 10m and a wide range of partition thicknesses. When installing you should ensure that electrical cables that pass through floor or ceiling are protected by grommets when installing studs. For fast and accurate installation we recommend use of an electrical or battery operated screw gun. For more information or for details of your nearest stockist please contact us on +44 (0) 121 601 6075 or Metsec.DryLining@voestalpine.com. Providing products for the construction and manufacturing industries. We focus on adding value through expert design, precision manufacturing and on-time in full product delivery.